51 % of the men and 42 % of the women are overweight in Europe. Every fifth person is considered to be adipose. HEWI has developed products with a vertical support load capability of up to 300 kg especially for people who are severely overweight. The portfolio includes functions such as support, sitting and gripping and is designed for use in the care sector. The care products are additionally reinforced to withstand high loads. 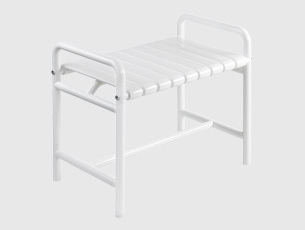 The shower bench is available in two different widths and provides plenty of space and a secure hold. The handles not only have a high loading capacity but also have an enlarged gripping area, so that adipose patients can also safely grip the handle. The sanitary range is made of high-quality polyamide and is reinforced with an internal steel core.